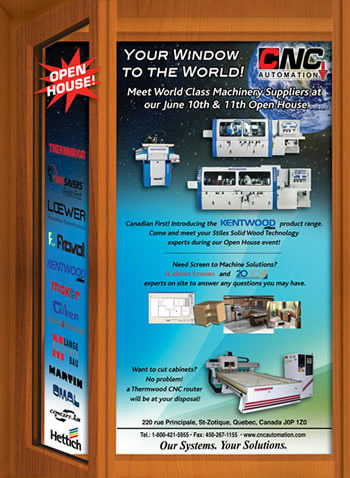 CNC Automation is holding an open house event on June 10 and 11, 2010 from 9 am to 5 pm both days at its St. Zotique, Que., headquarters. The event marks the official launch of the company's new Canadian Solid Wood Technology Division as well as the Kentwood by Stiles program of woodworking machinery. A number of machines will be in operation during the event, including a Kentwood 6 heard moulder, a Kentwood Profile Grinder and a Kentwood Multiple Rip Saw. In addition, Stiles solid wood experts will be on hand both event days. On the panel processing side, CNC Automation has announced it will have a complete nested based manufacturing cell in operation. The cell will consist of a Thermwood CNC router, Fravol & Lange edgebanders (straight and contour), Omal dowel drilling and inserting machine as well as a Giben computerized panel saw. The open house will also feature finishing solutions in operation including Timesavers Wide Belt sanders, Loewer profile and moulding finishing sanders as well as a Makor surface staining and coating machine. Representatives from hardware, software, tooling and dust collector manufacturers will also be on hand to address application questions. 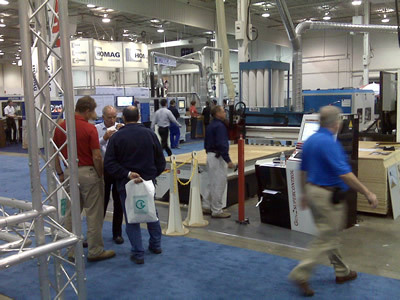 The booth consists of two Thermwood routers, CabinetShop45 and CabinetShop43., and two Fravol Edgebanders, S4 and S7. They are demonstrating eCabinet Systems and QuickCut on the CS43, cutting random cabinets and 20-20 Technologies is sending files to the CS45. 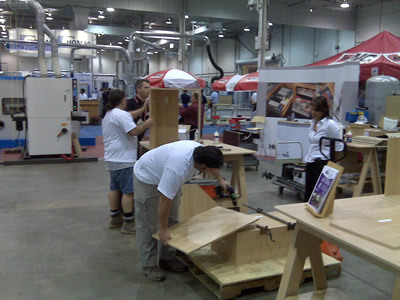 The CS45 is also creating furniture for Canada's Habitat for Humanity. Once the parts are cut on the machine, they will get edgebanding, finished and assembled right there in the booth, so there are other secondary type of machines within the booth.